The Angelus draws its source from the words. . . the Angel of the Lord declared to Mary. . . . Following these are three Biblical verses, each followed by the The Hail Mary prayer. 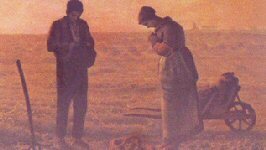 The Angelus is commonly recited three times each day: at 6:00 am, noon, and 6:00 pm. When the words are said . . . and the Word was made flesh and dwelt among us, it is customary to genuflect in reverence. Hail Mary, full of grace, the Lord is with thee; Blessed art thou among women, and blessed is the fruit of thy womb, Jesus. Holy Mary, Mother of God, pray for us sinners, now, and at the hour of our death. Amen. Let us pray: Pour forth, we beseech Thee, O Lord, Thy grace into our hearts; that we, to whom the incarnation of Christ, Thy Son, was made known by the message of an angel, may by His Passion and Cross, be brought to the glory of His Resurrection, through the same Christ Our Lord. Amen.